Heavy duty materials: Built strong with heavy gauge welded wire mesh panels on a 2” x 2” frame. Styles: Loss prevention cabinets come in two styles: single door (48" wide) and double door (96" wide). 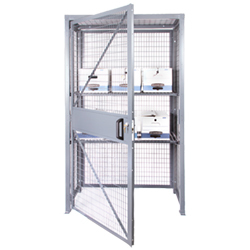 The double door model fits in a standard 96” wide pallet rack to create a secure palletized or bulk handling solution in any rack bay. Shelving: Additional welded wire shelves are sold separately so more levels can be added. Finish: Powder coat finish is available in standard gray or other custom colors; adds to cost and lead time. Contact us for more information.